A humor filled look at life in the trenches of parenthood. Shirtliffe's parenting philosophy isn't for everyone, but she doesn't gloss over the difficult aspects. Becoming a parent is an eye opener for most people. Things just aren’t ever going to be the way you pictured them before the kids actually arrived, and having a good sense of humor about it all will help keep your sanity intact while chaos reigns. 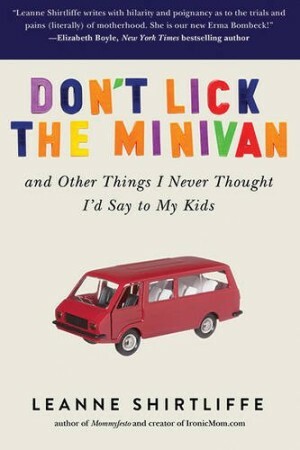 Don’t Lick the Minivan…and Other Things I Never Thought I’d Say to My Kids is one mom’s memoir of her journey through parenthood, and author Leanne Shirtliffe definitely has enough of a sense of humor to keep things in perspective. Shirtliffe’s career as a parent had a slightly more unusual beginning than most. During her pregnancy and delivery, Shirtliffe and her husband were Canadian transplants living in Bangkok. After an uncomfortable but fairly uncomplicated pregnancy, she gave birth to twins – a boy and a girl – and her life was never the same. 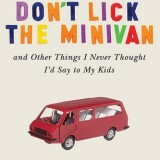 Don’t Lick the Minivan covers everything from pregnancy and delivery to a move across the ocean to the everyday crises of living with children while trying to stay sane. Although the book goes along in roughly chronological order, the stories are presented as a series of essays, some of which were previously published on Shirtliffe’s blog. This makes it easily digested in small amounts (which is good, because your kids probably won’t let you read in peace for more than five minutes at a time anyway). Though it does feel more like a book of short stories than not, the stories themselves are both humorous and relatable, giving stressed out moms an excuse to laugh at the many minor tragedies that occur whenever small children are around. For those who like a little sweetness with their humor, the end of each chapter also includes a tender letter that the author has written to her children at that point in their lives. Don’t Lick the Minivan and Other Things I Never Thought I’d Say to My Kids is a great gift for that stressed out mom in your life. There’s nothing quite like the feeling of knowing that you’re not alone, and books like this go a long way to combat the sheer perfectness of the lives we are presented with on our social media platforms. Being a parent isn’t easy, but is sure can be funny, and Shirtliffe’s book does a great job of reminding its readers of that.